Card packaging with this symbol, means that the materials used to make the packaging, have been harvested from sustainable forests. This means that the forest is managed in such a way that the trees are replanted so that trees that are cut down are replaced. A sustainable material is a material that can be renewed, such as natural wood - trees can be grown to replace ones cut down and processed into products. 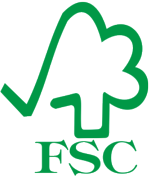 FSC The Forest Stewardship Council promotes the responsible management of forests - sustainable forestry. The logo guarantees that paper and card has been purchased from responsible forest operations (sustainable forestry).